Meet B. Mure. B Mure is an illustrator and comic artist based in Nottingham, UK with a particular interest in cooperatives, social issues and exploration. They recently published their first graphic novel, Ismyre, with Avery Hill Publishing and are working on a second as well as continuing their strange webcomic series, Boy Comics. B. Mure was a resident in the Light Grey Art Lab Norway Creative Residency Program 2018 and currently exhibiting in the Innuendo Exhibition at LGAL. Is there anything that is key to your process or your work space for making work? How important is your creative space? I’m quite fidgety and I often get bored working in one place! Obviously there are jobs that require staying with a particular bit of kit but I enjoy moving around, or popping out to a coffee shop if I’m in the idea generation stage. I actually often struggle working in studios, sometimes if I’m stuck going to do the washing up is really helpful. Can you tell us more about your creative community? Do you often have an opportunity to collaborate? In writing/drawing/comics? I have a lot of friends in Bristol, where I studied and lived for nearly 7 years, who are artists of various kinds. A lot of them have gone to live elsewhere in the world so I get to meet their creative communities wherever they live. Tabling at comic conventions has been great for this too! My sister who I live with is an illustrator too, as is my partner. I feel like I should be doing much more collaboration than I actually get time to! But I have some things I’d like to do with various people when I can carve out the time. Where do you get the ideas for your boy comics and what is your favorite part about making them? I think of the Boys as weird creatures who have learnt about human interaction just by watching lots of sitcoms. A lot of it is just thoughts I have I think are funny as I fall asleep. My favourite part is when I make myself laugh while drawing them, that’s how I know it is just good/bad enough. 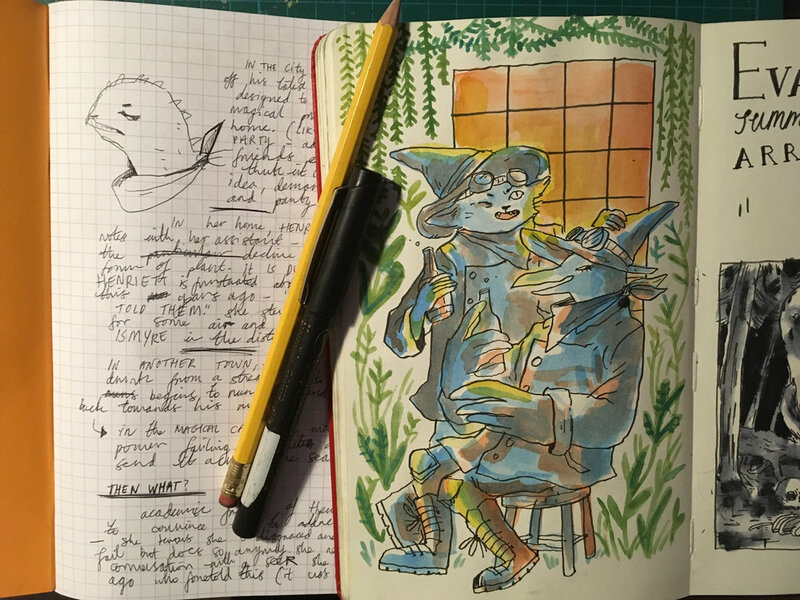 You mainly use animal characters to convey your ideas in your work, is there an animal character that you enjoy drawing the most? What animal traits are you most drawn to? I definitely enjoy drawing rabbits the most! I love drawing ears and eyes, they add so much expression. Having said that, I also really like drawing non mammalian animal people (one of my favourite characters is a crocodile lady from the first book). What was you inspiration for your graphic novel Ismyre? I’ve always been really inspired by Evan Dahm’s work, especially Rice Boy and that was a big driving force. A lot of it came from a workshop exercise I did at university with the illustrator Graham Rawle, who gave us prompts to write and illustrate a 100 word story. It stuck in my brain for years! Those exercises can be really great for sparking something. What draws you most to fantasy themes in your work? I always really loved fantasy stuff as a kid! Games as well as books and comics. I loved sci-fi too, but always really really wanted to write a big expansive fantasy novel (and somewhere there are abandoned chapters of various stories about necromancers and werewolf packs and stuff). It was just always the thing I was the biggest geek about, making fantasy based work feels really homely to me. What is your process when making your larger scale graphic novels? What are some of the biggest strides in this area of work you have made in the last year? I tend to write a summary rather than a script and estimate how many pages I might use to tell it. This bit involves lots of noodling about, walking and thinking and phoning people to ask them if a thing works or not. Then I do a lot of thumbnails and sketches and editing, before going through the lightboxing, inking and painting (which I do in a kind of conveyer belt way, I have a tick sheet where I make a mark every 10 pages I sketch/ink/colour). Then there’s usually edits to do at the end. It sounds organised but there’s usually a lot of chaos and flapping in there too, but I’ve got a bit better at giving more time and space to things (which is a necessity when it comes to your wrists!) and not freaking out as much. When making your work, what is your most important idea that you focus on conveying? I always want to get across the feeling of a thing, whether it’s meant to be forlorn or hilarious or frivolous. I think I can always get better at it! But the emotion is the most important thing to me. What do you enjoy most about working on long term projects like Ismyre and Terrible Means? What kind of challenges do you look forward to? Before I did Ismyre I actually didn’t think I was capable of doing a long term project. I always really wanted to but would get distracted part way through and leave things on the back burner. So it’s enjoyable to prove to yourself you can! With every book I definitely learn a lot too and it’s a fun challenge to think of things to draw and go, “I could never draw that” and working out how to do it. What plans do you have for your work in 2019? Any projects in the works? New mantras? I’m working on another graphic novel set in Ismyre, called The Tower In The Sea that’s due out in the autumn, so that’s exciting! I’m also currently doing an MFA too and I’m having fun playing with some larger scale illustrations and getting into doing ceramics. I’m trying to put less pressure on myself this year and remember what it’s like to really enjoy making things in a more conscious way. You have said that you like to make playlists for your projects; in honor of the Innuendo show, what are your top 10 love songs? Thanks B! You can find their work as a part of the Innuendo exhibition running through April 19th. You can find the rest of B’s work at their website : https://www.bmurecreative.co.uk/ , their Instagram https://www.instagram.com/b_mure/ or their Twitter https://twitter.com/beemure .